The following is a list of supplies for heat transfer we carry. To order our transfer papers, please go to the Transfer papers page. To order our heat transfer vinyls, please go to the Transfer Vinyls page. Often we make mistake in heat transfer vinyl pressing to t-shirts or expensive uniforms or sports jerseys. You wish you can undo it and do not waste money. No worries, we have a solution for just that! AlbaChem VLR 1020 Heat Transfer Vinyl Remover can completely removes heat transfer vinyl and the adhesive residues from almost any fabrics. It is easy to use, highly effective and fast drying, thus saves you time and money. Best still, it does not contain any carcinogenic chemicals. Every heat transfer vinyl user should have one handy! 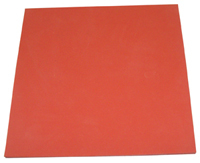 Teflon Sheet is an essential accessory for heat press machine. It has a temperature rating of 500°F (260°C). Its non-stick makes easy to wipe off any dirt or ink marks. 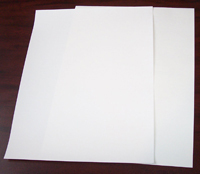 Placing a Teflon sheet in between your heating platen and transfer paper or vinyl / substrate can do two things for you: keep your heat press clean, and keep your transfer paper, vinyl and substrate from scorching. Teflon sheet is reusable and can last for a long time. 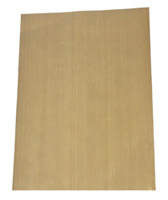 Size: 15 x 20", 16 x 28"
Parchment paper can be used for heat pressing transfer papers for dark color fabrics so the result surface is smooth. Place a sheet of parchment paper on top of the dark color transfer paper and beneath the Teflon sheet. It is heat resistant. This parchment paper is reusable as long as it is clean and no discoloration. This high quality silicone rubber pad is designed to provide worktop (placed on the bottom platen of your heat press) where you do your transfers. Every flat heat press comes with such a pad. Replace with a new one if it's getting dirty or burnt. This heat-resistant foam pad, placed below your T-shirt on the bottom platen of your heat press (or on top of silica gel mat on the bottom platen), provides the perfect contact between your transfer and T-shirts (or other substrate), retain more heat. It can be used for heat transfer to garment with thick seams, zippers, pocket, rhinestone, etc. It can also be used for filling the gap for heat transfer to caps and hats, mugs, and much more. 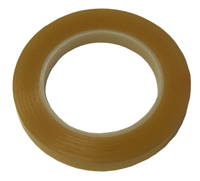 This heat tape is ideal for fixing the transfers to substrate such as mugs, cups, plates, tiles, etc. in perfect position, and makes your heat transfer perfect. 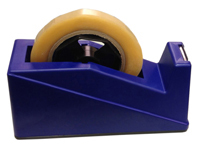 This non-skid desktop tape dispenser can be used for both 1" and 3" core tapes, ideal tool for use with our heat tape as well as many commercial tape (such as masking tape).